Thanks cgjay, I've asked for a price on the rear bar. Looks ideal. Also love the rotating fridge slide which moves the fridge weight onto the axle rather than in front of it. The unloaded Evo trailer has a ball weight of 150Kg which is just enormous so even moving a fully loaded fridge back a bit will make a big difference. Last edited by WomblingFree on July 27th, 2014, 3:30 pm, edited 1 time in total. One of the casualties of Johnnos lack of sheet metal edge sleeving was the filler hose for the main water tank located at bottom right in the pic. Its replacement is the big white hose. 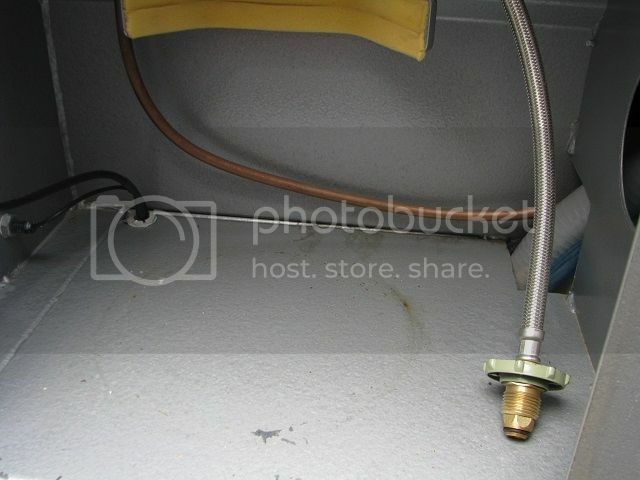 This hose had cut through at the base of the LPG locker resulting in a small flood whenever that water tank was filled. 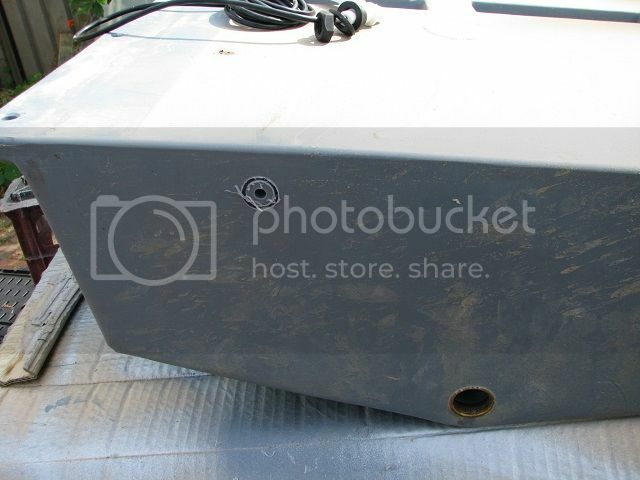 I removed the water filler from the side of the trailer to replace the hose and discovered yet another rusting unpainted hole in the steel plate to fix up. Fitted a new flexi hose and also sleeved it at the rub point so its unlikely to cut through again. Note that the LPG locker is not meant to be a waterproof sealed space. 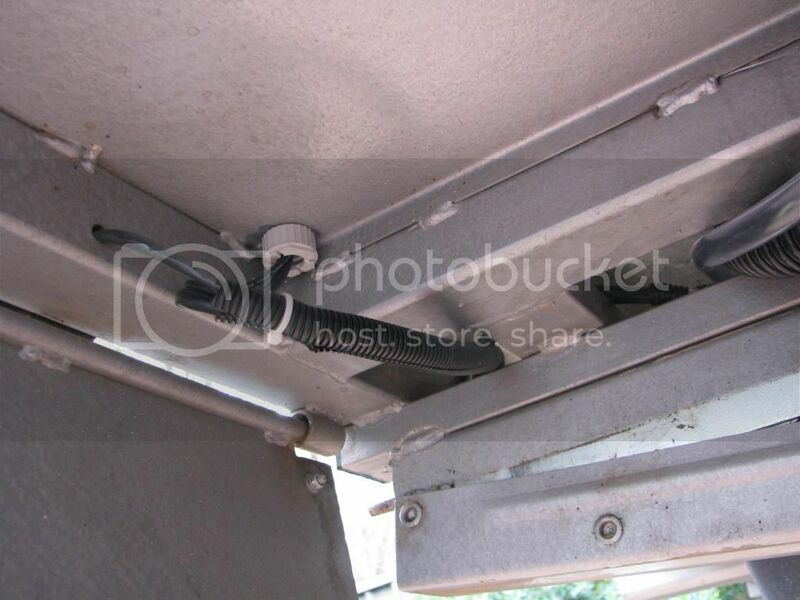 This is so as to allow any leaking LPG gas to ventilate and hopefully not explode the camper. Even so, there is no excuse for once again failing to seal some of the gaps so as to prevent mud build up and hence promote rust. Here's a typical join involving a foldedfloor plate butted up against the chassis. It just fills with mud, retains moisture and then eventually it will rust. and seen from below- Note I had to sleeve the cable entry hole here as well. Another crappy bare, unpainted, drilled hole. The water filler fittings have provision for an air bleed hose from the water tank but, for some reason, Johnnos chose not to use them resulting in quite a bit of splash back when filling the tanks. Simply remove the 'push in' plastic plug and... instant vent hole. This begs the question, what has Johnnos done to the vents on the actual water tanks? 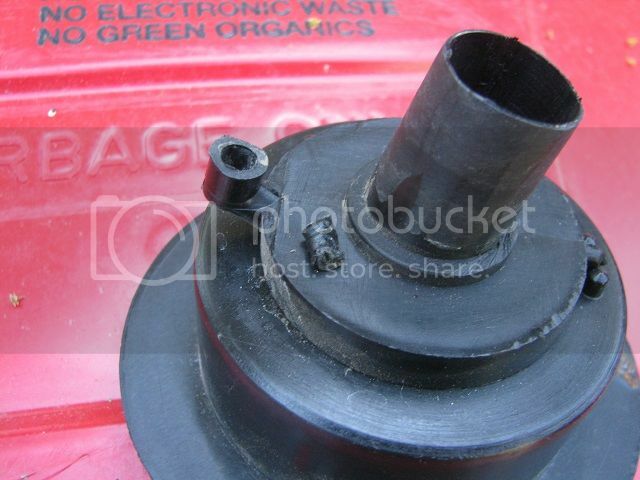 The vent pipe is the stubby bit of hose going nowhere on the top. I guess none of Johnnos staff have ever driven a camper trailer through a muddy river before. Another unbelievable shortcut! It only requires a short length of hose back to the water filler fitting via appropriate sleeving and the problem is so easily solved and avoided. Whilst the water tank is out, I take the opportunity to fit a water level sender. This is a very straight forward 10 minute job. 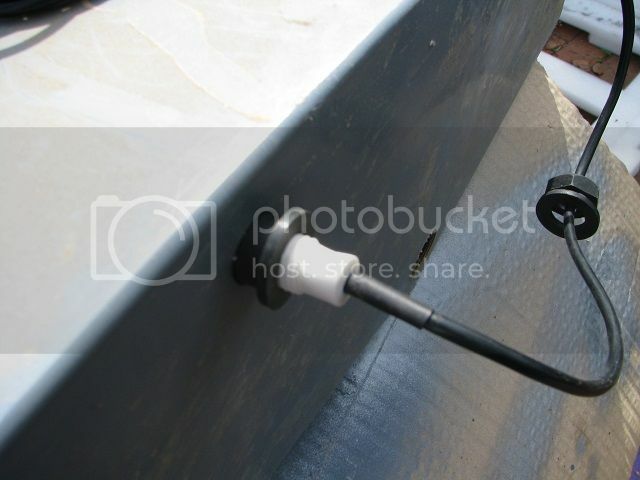 It simply requires a hole saw to drill the hole through the 12mm plastic side. Slide in the sender unit and tighten the bolt. 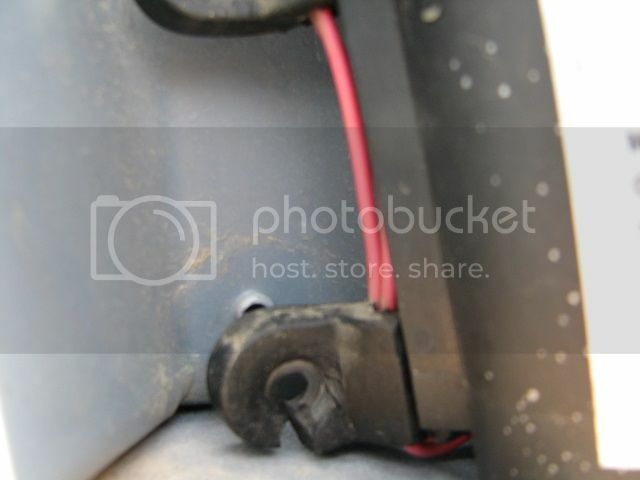 The tightening action spreads a rubber gland, effectively sealing the sender hole. The cable was shortened and run back to the water level display in the battery locker. Reinstalled the tank and its done. Guess I'll have to drop the front tank as well now as I doubt lazy Johnnos dealt with it any differently to this one. Ran a hose to the filler bleed point, filed the hole smooth and painted it. 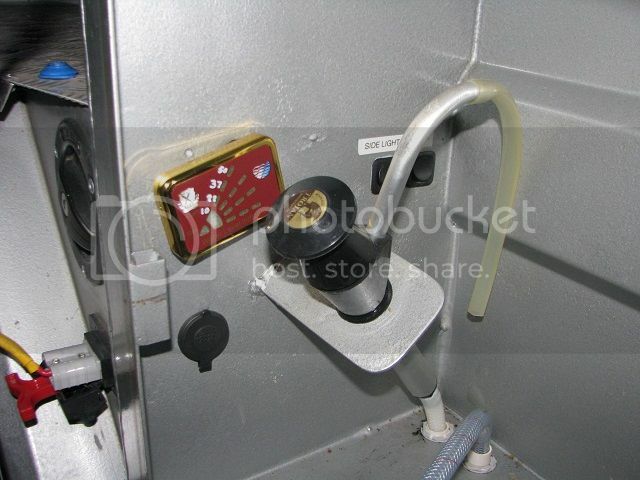 Also fitted a water gauge for this tank into the water heater locker. The locker gets too hot for the rubbish double sided foam tape that comes with these displays hence it keeps falling off. Now siliconed until I find something better. 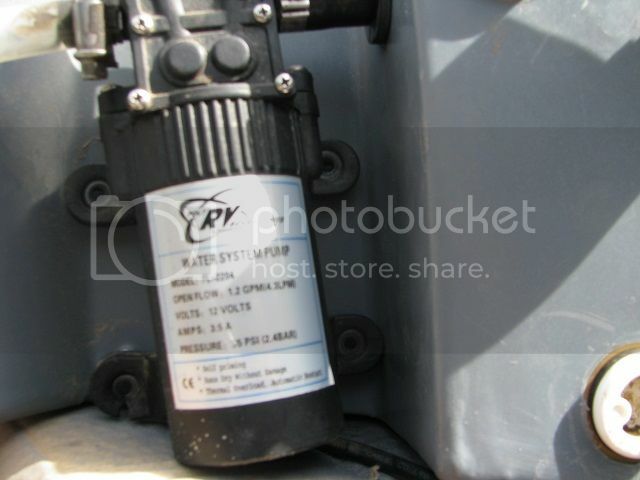 Whilst both tanks were out, I noticed that all the rubber bushes that mount the pumps to the tanks are broken. The screws that go through the bushes are way too big for the bush holes so they have all split. As the screws go right through the plastic tank, I can't fit thinner screws but I'll need to find a better mount arrangement. Pretty crappy having them all fail within a couple of years. Even a washer under the head of the self tapper screw might have saved them. Another example of Johnnos lack of attention to detail. The water tank manufacturer found me some old mounts salvaged from other dead pumps that he had. I've drilled out the mounting holes to 6mm which still gives a little grip on the screw, enough without spreading and splitting the mounts again. Mounting blocks replaced, pump wiring checked and screws not over tightened. 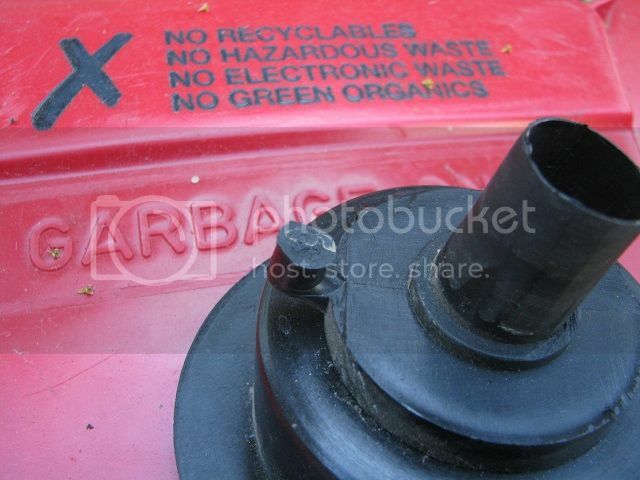 The front wood bin (which doubles as the jerry can holder) has a 16mm bolt for screwing on the shower pole. 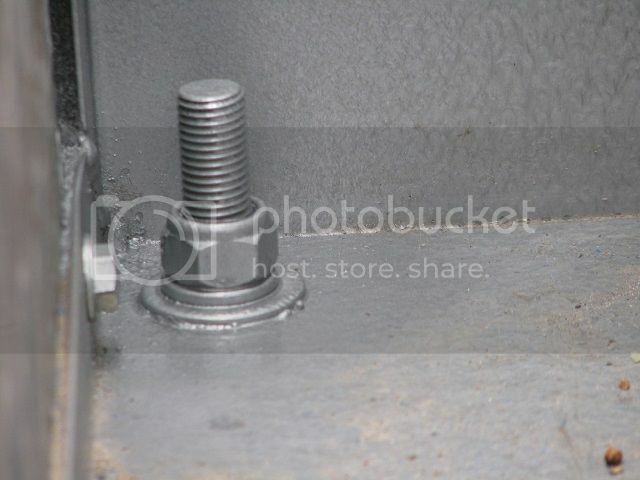 Although a galvanised bolt was used, the washers were only nickel plated and were rusting away nicely. Removed it all and cleaned up the rust. Fitted hot dip galvanised hardware with a nylock nut and painted over the lot. We have a Weaco 80L fridge which fits in the fridge slide/drawer very nicely however the slide action has always been very lumpy such as when the roller wheel bearings are not all in line. Pulled the drawer out and stripped it down. Suprisingly, none of the holes had been painted after drilling but they were all nicely inline so where does the lumpy feeling come from. Pulled out the slider rails and discovered a few more factory 'shortcuts'. Again, no painted holes and no lock washers for the rail to floor locating bolts. 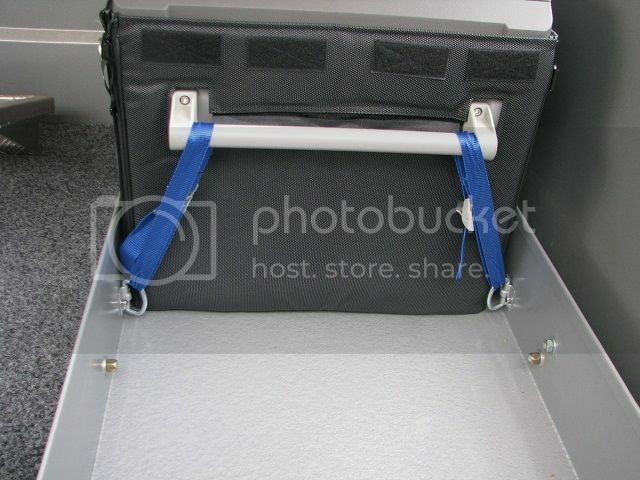 Bit of a bugger if the drawer slider bolts dropped out the bottom allowing the tray complete with the fridge to slide around inside the trailer tub. 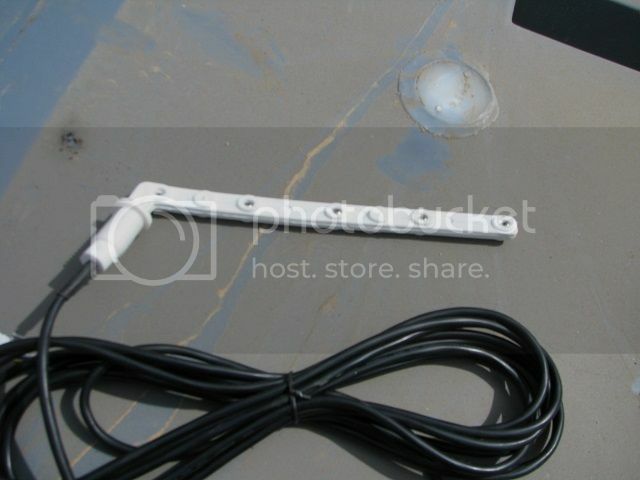 The slider rails are made with large rivnuts inserted into them to provide the nut points for anchoring to the floor. These rails are spaced up from the floor pan with a washer placed under each rivnut. Holes painted, rusty mild steel bolts replaced with stainless bolts, larger stainless washers fitted to keep the rails square to the floor, readjusted and all is good with the lumpiness gone. Pretty poor lack of attention to detail in a $27K camper. gqjay wrote: The original bloke who started Johnno's before selling it off about 15 years ago is back with a new camper trailer called "altitude camper trailer" and its the same looking camper trailer as Johnno's. But built by a different company. They do a swing away rear bar which may fit your evo. Well 4 emails and lots of voice mailed phone calls and I finally got Altitude to answer the phone (which is a mobile). Not interested in selling anything. Not a company I'd want to buy from as you can't get any support if they don't answer anything. Really, not much has changed. Thanks mate, I'd really appreciate that. I really love the rotating fridge idea and would like to have a go at making something up. I don't understand their attitude, after all when you are tooling up to make a few, what's one more in the run and it helps get their name out to the market. As they only have a mobile phone for contact, I guess it must be a 'one man band' and one camper build probably overloads him. 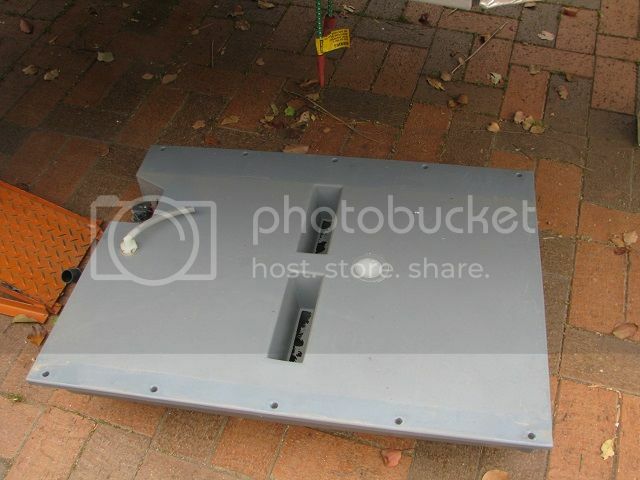 Pity though, I'd have bought a water tank bash plate as well as its the same tank. Would have saved me a lot of work. There are a few pics on their website and i/net but I haven't found anything detailed yet. 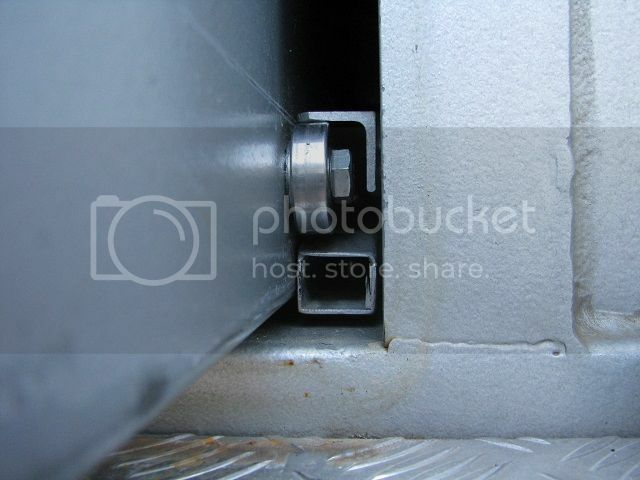 The hinge bit where the fridge is rotated 90 degrees looks like the difficult bit as it has to be pretty bullet proof to take the weight of an 80L fridge. Should be called "attitude camper" ... I read he is trying to start up franchises again. Good luck with that I guess. I Just ordered the new Johnno's hardfloor hybrid trailer and after looking at all there trailers,I'm sure the new evo has a plate around the water tanks. Try your local johnno's dealer and see if will fit your model. Congrats on the purchase. Hope you do a write up on it. Yes the current ones ship with bash plates as an option. Problem is getting one from QLD to Sydney. The main sales guy at Johnnos doesn't like replying to emails either and despite seeing him constantly at shows, I've never managed to pin him down to a price. Currently trying to get him to ship one to the next Sydney show but no idea of the price yet. I only want to protect the front tank as its sticks down lower than the axle. These tanks are about 12mm thick plastic so reasonably bullet proof. The water tanks are thick. One concern with the a plate around the tank is rocks can get jammed and adventually wear a hole through the tank.....It has happened...It's good a peace of mind having protection but also a good place for rocks, sticks to up between. Have to make it habit to remove and clean every so often. 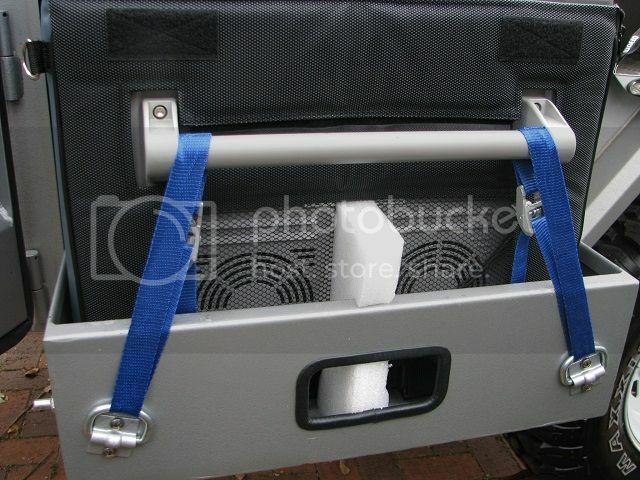 I made up some 'hold down' straps for the fridge as it floats around in the drawer quite a bit. Found some suitable brackets on Ebay to hold the straps. The block of foam between the fridge fans is to aid fridge cooling. The Waeco CF80 exhausts its hot air right next to the ambient air intake which limits cooling potential considerably. Coupled to this is that the fans are essentially in the locker doorway area so there is very little air exchange with that in the main tub.. 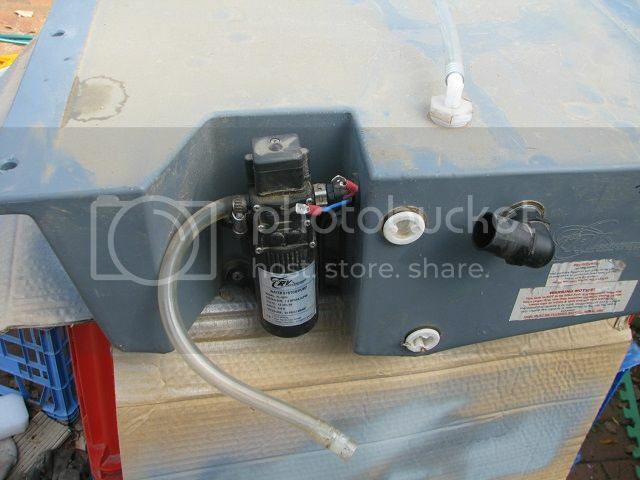 The foam makes it harder for the exhaust air to be sucked straight back in again and, as a result, the compressor's duty cycle has improved quite a bit. Needs a better long term solution which will require some fridge mods in the future. It'd be nice to fit a vent into the locker door but we need the tub water tight for river crossings. 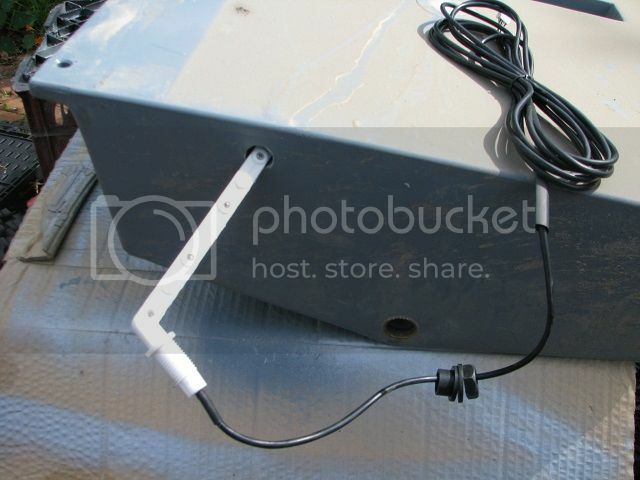 Vent it up using an angled plate. May give a little bit of temp difference between air on and off the condenser. 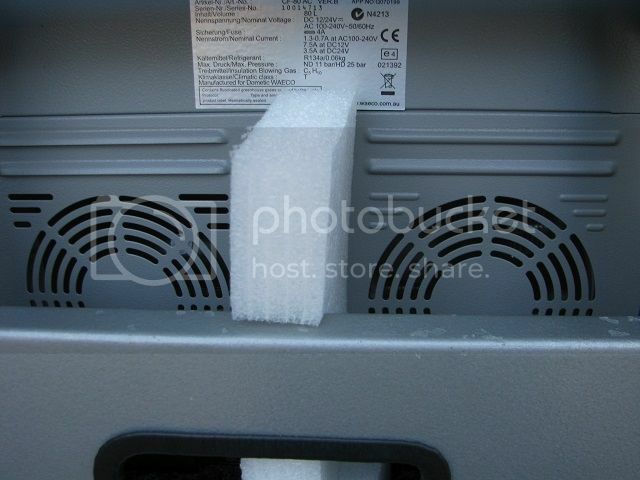 Add a plate over the top of air on to force the fan to draw the cooler lower air.